Metropolitan Custom Homes makes you want to remodel your home just so you can use their services! I contracted with Metropolitan to do a total remodel of my kitchen and Master suite. Mine was a unique situation in which a comple renovation of a home was being handled by two contractors. Metropolitan exceded my expectations in timeliness, workmanship and professionalism. I have now contracted with them to correct the mistakes made by the other contractor. 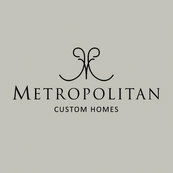 I recommend Metropolitan Custom Homes without reservations.